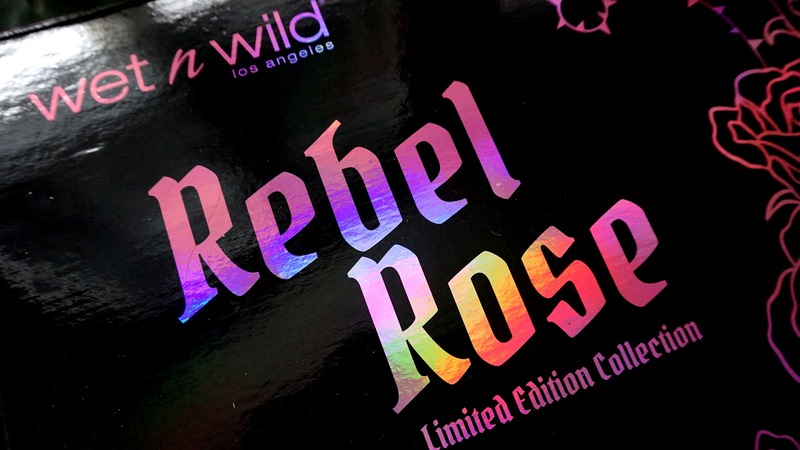 Wet n Wild brings to you the limited edition Rebel Rose Collection, which can either be bought in its entirety in a makeup or skincare set, or in individual pieces. Rebel Rose Photo Focus Rose Toner - this toner which contains Rose Water, is alcohol-free and helps with hydrating your skin, it has a very subtle rose scent and can be used either as part of your skincare routine, or even to be used before makeup application, to set your face or to refresh it during the day whenever you want a pick me up. Rebel Rose Photo Focus Rose Primer Serum - This serum is water based, and contains botanical extracts of cucumber and goji berry to help pack on the moisture to the skin. This would be a great all season product as it will not add to the grease factor of the skin and would just provide some hydration and plump up your skin (which is something you would need all year long!). 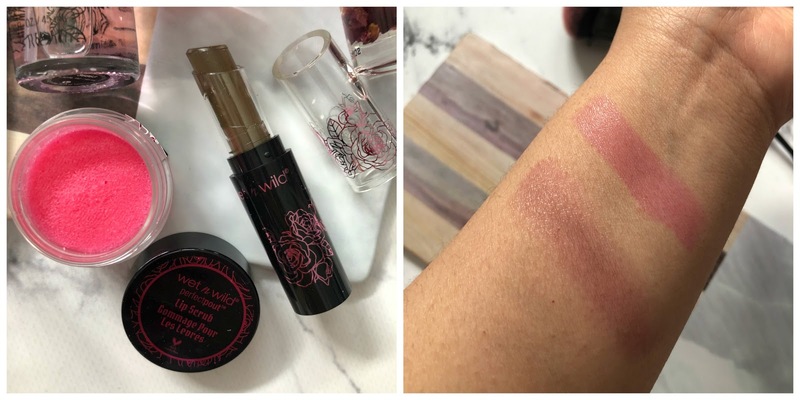 Left: Wet n Wild Perfect Pout Lip Scrub / Right: Tint of Corruption Lip Balm and Rose in Peace Creme Blush - these two products adjust to your own customized shade of Berry Pink according to your pH levels. The Lip Balm honestly surprised me and I would have to say is my favorite lip product (after that are the glosses from this collection). It is almost jelly like and watery in texture and is so moisturizing and just glides on effortlessly on the lips. It leaves behind a pink-ish tint after it adjusts to your custom shade of pink that looks very natural on your complexion, It contains a blend of Vitamin E, Sunflower Seed Oil, Virgin Passion Fruit Seed Oil and Argan Oil to moisturize and nourish the lips. The Creme Blush is beautiful, you can use a finger to dab and blend on the cheek or you can use a stippling brush to apply it on the cheeks. It is creamy, feels comfortable on the cheeks and also contains a blend of Murumuru Seed Butter, Shea Butter, Vitamin E, Sunflower Seed Oil, Virgin Passion Fruit and Argan Oil to keep your cheeks hydrated. It stays put on the cheeks and does not run or fade through the day. Lipsticks - From top to bottom we have: Bad Romance and Petal Poison which are glosses. They call them the hi-shine lipstick, it is the first time I've tried this formulation and I love it! It's shiny, it doesn't bleed out of the lip and has a beautiful color payoff. It is creamy and feels like cushion on the lips and contains a blend of vitamins, plant-based oils and butters like Vitamin E and Murumuru Seed Butter for moisture. I have actually been seeing the ingredient murumuru more recently, in skincare as well! Kiss of Death and Deviant Damsel (which are liquid lipsticks). 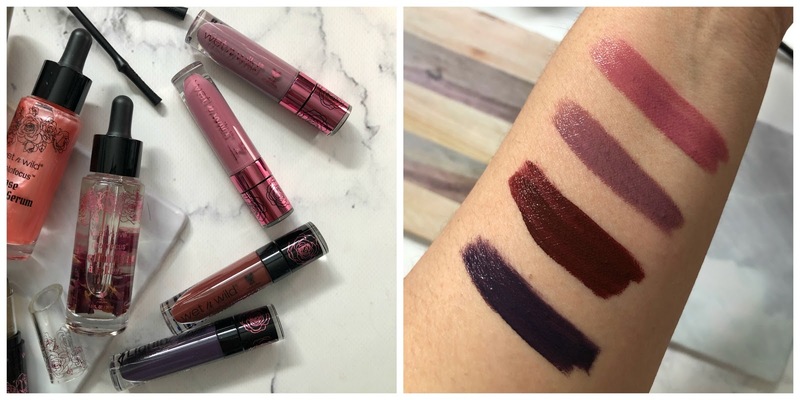 The liquid lipsticks are honestly probably one of my favorite drugstore formulations, it has great staying power, doesn't feel dry on the lips and has great opacity - one swipe! It contains Vitamin E and Macadamia Derivatives to help moisturize the lips. 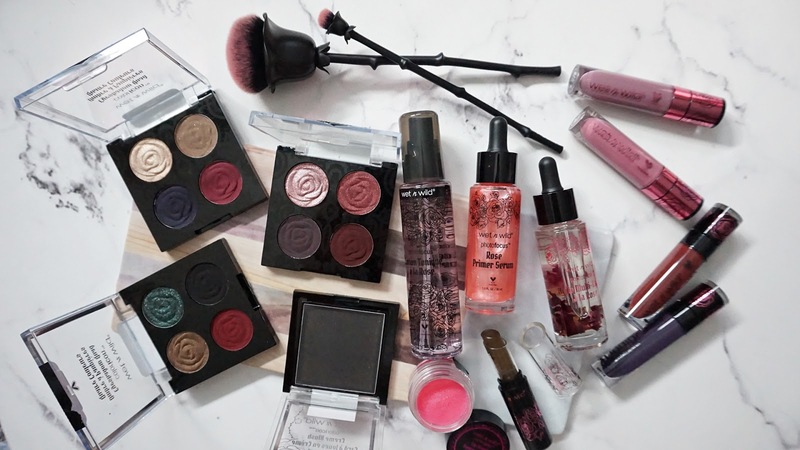 Everything in this collection is rose themed - from their Rose Multi-Use Oil with real rose petals suspended within, to their ever so soft and fluffy brushes. The Multi-Use Oil, is really as what the name suggests - you can use it for the face, body, hair and nails and is not greasy and thick. It feels almost like water in texture but has a very subtle rose scent to it that does not smell overly perfumed or artificial (something I really appreciate). It contains Vitamin E, Sunflower Seed Oil and Argan Oil for hydration and absorbs very quickly on the skin. As for the eyshadow quads below, their shimmers are beautiful, pigmented - as are their mattes. 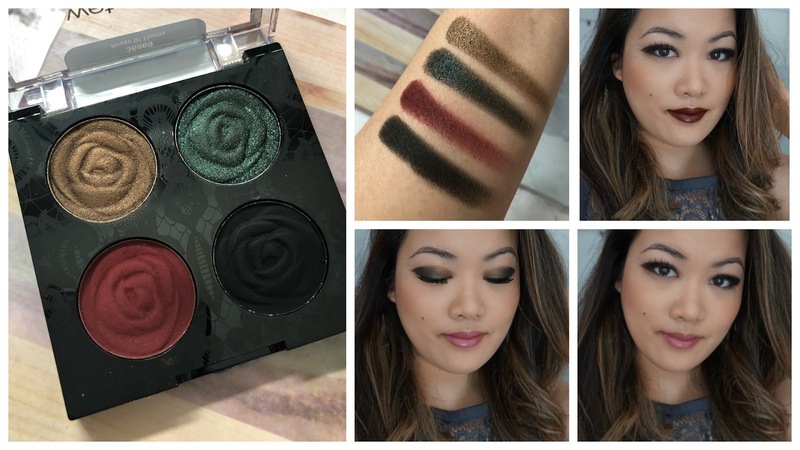 Initially, the mattes felt a bit dry when I was finger swatching the,, but when applied to the lids it blended out effortlessly and had great color payoff. For being a drugstore product and with such an affordable pricepoint, there really are zero complaints. 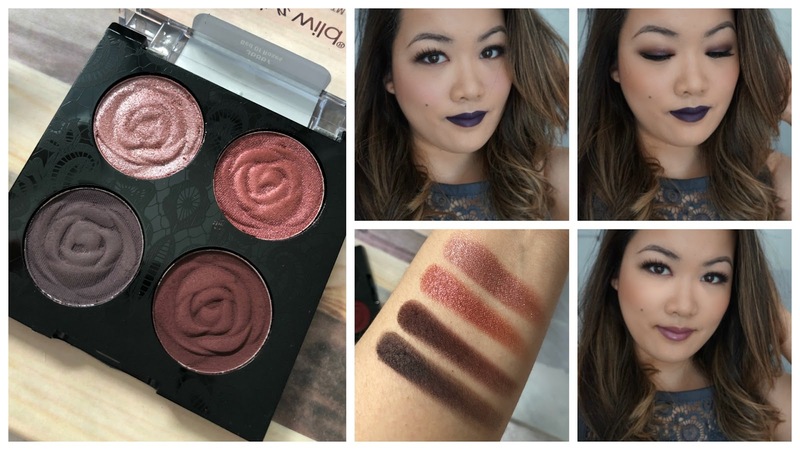 I took each quad and created a different look with it - a smokey look with the Bed of Roses Quad, an edgey more modern one with House of Thorns Quad and an everyday natural look with the Secret Garden Rendezvous. Quad. Which one is your favorite? 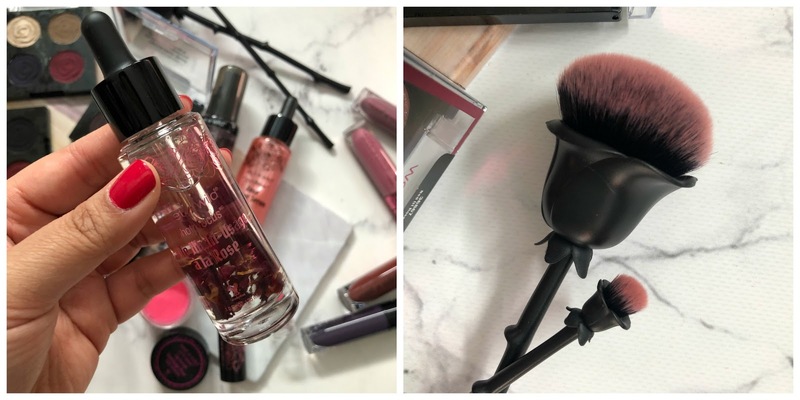 Out of the whole collection, I would suggest that your must haves are the Lip Balm, Cheek Brush, Multi-Use Oil, the Glosses and at least one of the shadow palettes. I know it seems like alot that I'm selecting but really, the prices and the product itself speaks volumes! Which product are you most interested in? I'd love to hear from you! That dark lipstick looks AMAZING on you! This collection is so badass. OMG thanks so much! I always find dark and bold lips so intimidating so thank you so much! WOW you look so good in that grey lipstick!! I used to love dark lip colors but now I prefer a lighter brown toned shade. I've also been really digging rose scented toners recently. Thanks so much girl! I find them so intimidating, I always gravitate to the mauvey pink berry tones... hahaha! like those my lips but better shades but it's nice to know the feed back is good on these!